Around The Office - January 2018 | Rocco & Associates Wealth Management, Inc.
A New Year, a new you! By this point you have already joined the gym and cleared the cupboards of all that junk food left over from the holiday season. However, it’s is also a great time to make some financial resolutions as well. 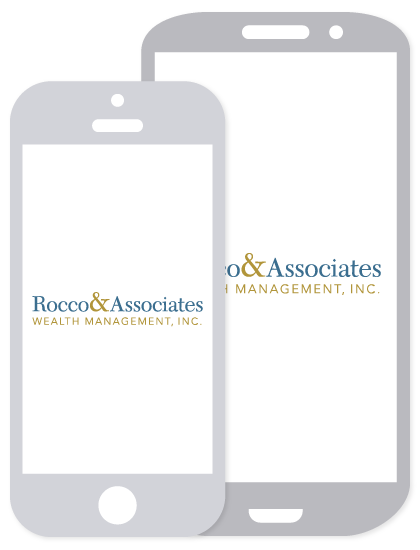 At Rocco & Associates, we help our clients identify financial areas of concern that should be addressed to improve financial well-being in 2018 and beyond. Retirement: We are constantly telling our clients how important retirement is and that it may not happen unless there is a plan in place. Contributing up to the match in a company sponsored retirement plan is a great first step. The matching dollars are essentially “free” money, which is a hard thing to pass up! If you don’t have a company sponsored plan, don’t worry, you may still be able to take advantage of the tax benefits by opening an Individual Retirement Account. As always, our team is here to help you accomplish these financial resolutions and has a host of tools to assist you in doing so. Give the office a call today to help you work towards a prosperous 2018! 2017 Toy Drive Another Great Success! For the third year in a row the Rocco & Associates Toy Drive was a great success. Thanks to all of our clients and partners for supporting the cause. 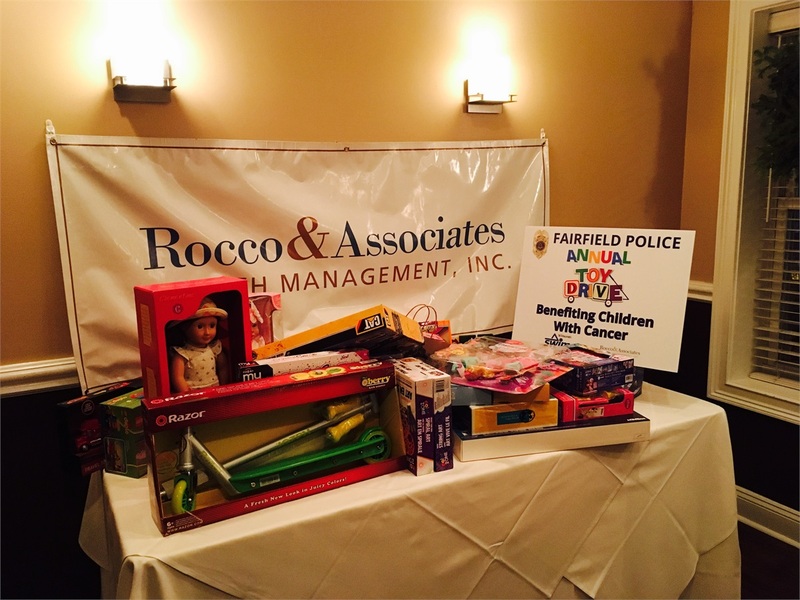 This year the firm partnered with the Fairfield Police Department to collect toys that were distributed to pediatric cancer patients at St. Vincent’s Hospital in Bridgeport. Although many stopped by the office throughout the holiday season with unwrapped gifts, a majority of the donations were made by guests who attended our Holiday Reception on December 7th at the Old Post Tavern. We are all looking forward to topping last year’s success in 2018! Quick! List three adjectives that you think of when we say “health insurance.” Complicated? Expensive? Unpleasant? If these were indeed your responses, we need to see you in January! Feel free to bring a friend, relative, or anyone else for that matter that may need some assistance with their individual medical plans or Medicare policies. 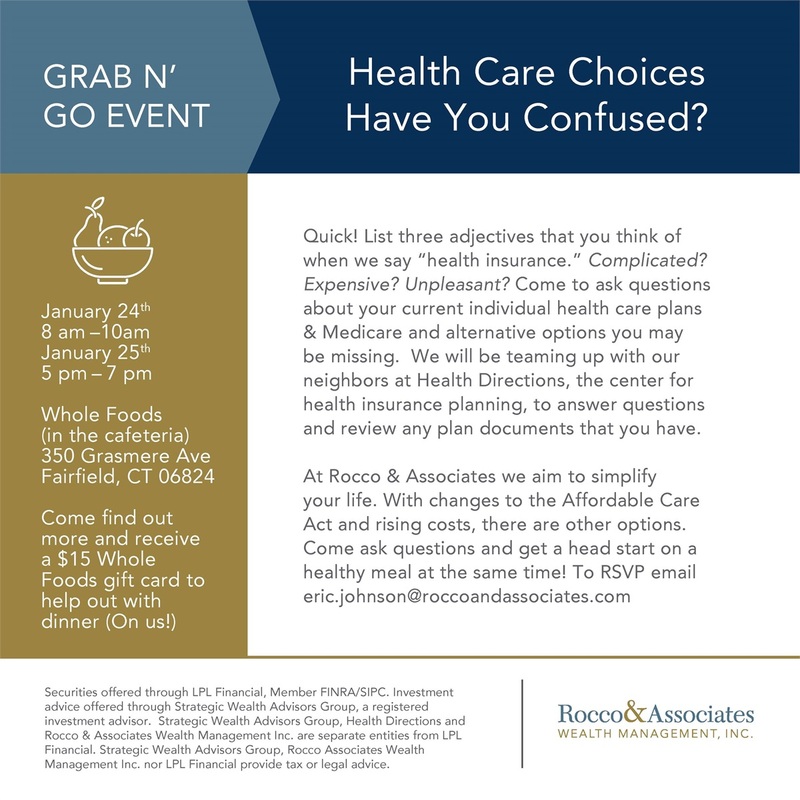 Rocco & Associates will be teaming up with our neighbors at Health Directions (www.health-directions.com), the center for health insurance planning, to answer questions and review any plan documents that you have. With changes to the Affordable Care Act and rising costs, there are other options. Come ask questions and get a head start on preparing a healthy dinner at the same time! All attendees will receive a $15.00 gift card to Whole Foods. The two events will be held in the cafeteria area at Whole Foods in Fairfield located at 350 Grasmere Avenue. There will be two sessions, January 24th, and 8:00 A.M.-10:00 A.M. and again on January 25th from 5:00-7:00. If you have any questions and to RSVP, email [email protected].